If you aren't a coffee drinker, but you get a little sad when you see all the yummy pumpkin spice flavors pop up at Starbucks, Shelly has come to the rescue with a pumpkin spice hot chocolate recipe. Of course, if it doesn't cool off here pretty quickly (it is still over 100 degrees here) I am going to have to make it as a frozen hot chocolate. Have you ever ordered an iced hot chocolate from Starbucks. They will make it, but they look at you like you have lost your mind. Ask me how I know. You can get the recipe for this yummy hot chocolate over at Cookies and Cups. I bet it would be really good with pumpkin pie bread. 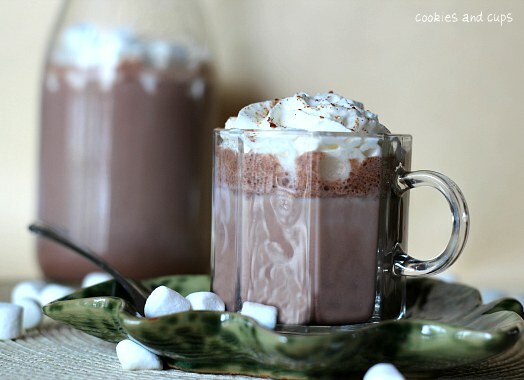 You can also check out all of the other hot chocolate recipes I love.